Piqora – provides a suite of Pinterest analytics on pins, boards, clicks and pages that help brands engage, grow and measure their audience on Pinterest. 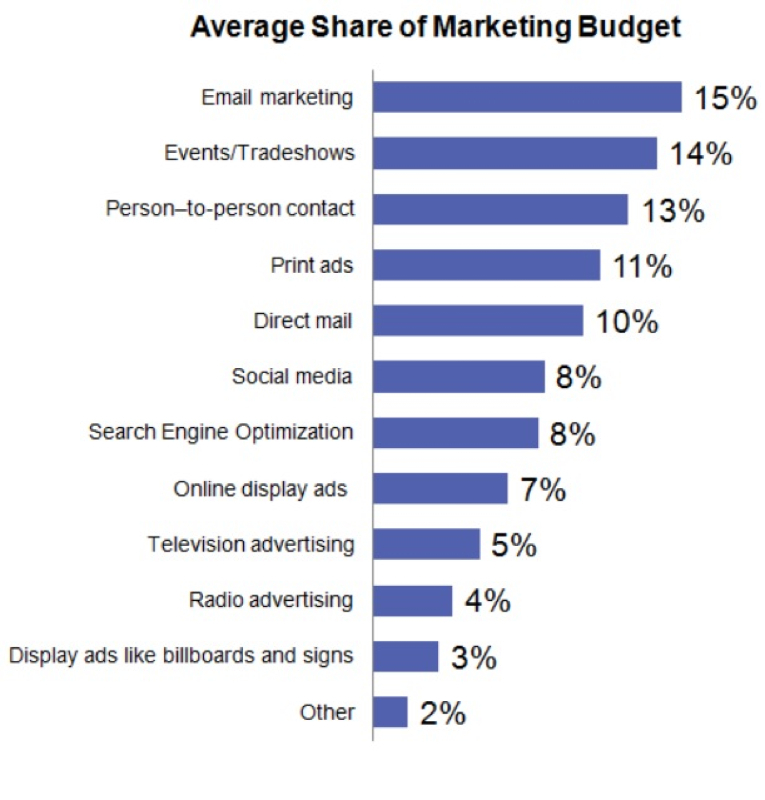 According to a study commissioned by iContact, small and midsize businesses are allocating the largest share of their marketing budgets to email, with more than half spending up to 20 percent of their total marketing dollars on email marketing efforts. Edge Research was commissioned by iContact, an email service provided by Vocus, to conduct an independent study surveying 601 email marketing decision makers at companies with an annual revenue of $1 million to $50 million and no more than 1,000 total employees. Respondents had to be involved in email marketing decisions, have knowledge of how their marketing budget was distributed, and belong to an organization that owned their own list and used an email service provider. The study discovered that email marketing received, on average, 15 percent of an SMBs marketing budget, with more dollars going to email than any other marketing tactic. 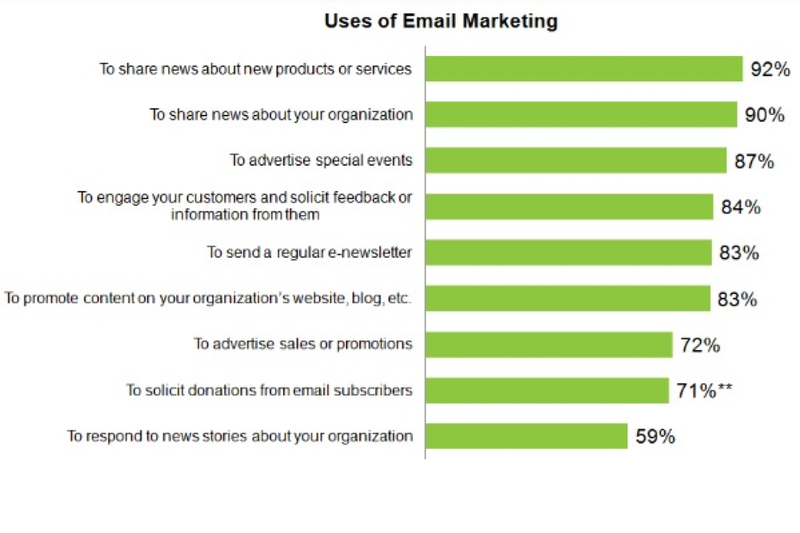 While there are a number of reasons companies use email marketing, 92 percent of the respondents confirmed that they use email to share news about new products or services. The least likely reason to send an email was to respond to news stories about their organization. Even though only 59 percent of companies used email to respond to news stories, 70 percent of those companies were organizations with $30 million or more in revenue, mostly because large organizations are more likely to be in the news. Of the companies surveyed, the median email subscription list size was nearly 3,500 subscribers. One-quarter of the companies had fewer than 1,000 subscribers and one-fifth of the companies had more than 10,000 subscribers. When asked how they grew their email subscription list, 95 percent said that they use their website. More than 65 percent of respondents said they purchase or rent lists from a vendor in addition to the list they owned. 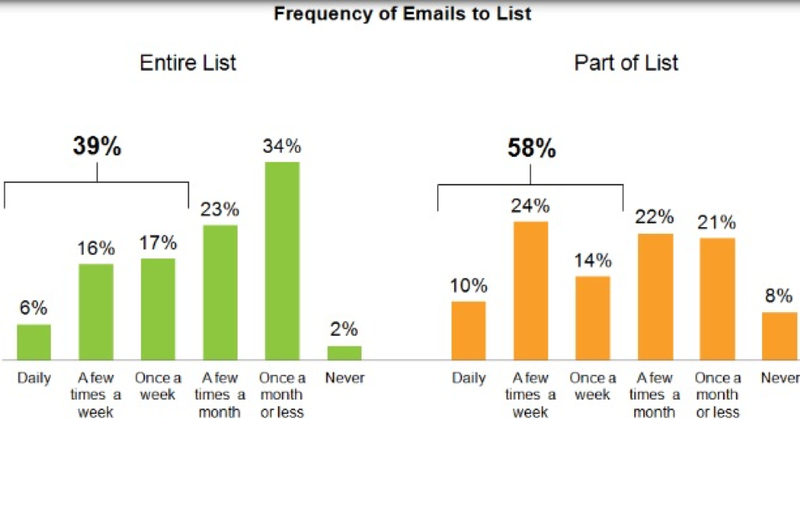 Only six percent of respondents email their entire list daily, while 39 percent email their entire list once per week. Most companies report sending emails to a portion of their list approximately once per week. Of the thirteen individual email marketing metrics listed in the survey, companies are most likely to use click-through rates, the amount of traffic an email drives to a website, and the number of leads it generates to measure success. Sales and revenue are also a common metric used to determine whether or not an email is successful. Few companies use cost as a metric, even though email marketing accounts for the largest share of their marketing budget. One of the most interesting findings of the survey was the inconsistency between confidence in email marketing and the perceived effectiveness of email marketing. When asked how confident they were in their organization’s ability to put together the best possible marketing strategy for a specific medium, respondents ranked email marketing third over a number of other marketing tactics, including social media, print ads, direct mail, online display ads, and SEO. But, when asked about the effectiveness of their marketing efforts, email marketing ranked ninth on the list. iContact published a report last week, outlining key findings from the survey. 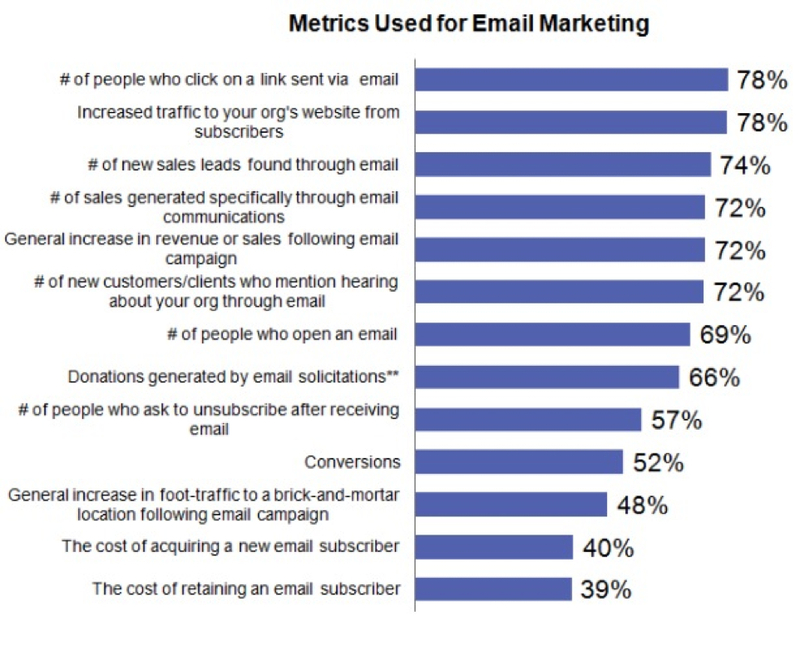 While the report confirmed there was no one-size-fits-all solution when determining how much to spend on email, it did reiterate the importance of defining email marketing budgets based on the number of meaningful, targeted communications a company can send to their list, and the anticipated return on investment. According to iContact’s report, if companies want higher open, click-through, and conversion rates, they must ensure that they are sending only relevant, timely and engaging emails. Social media marketing works, at least in part, because brand messages gain objectivity when shared by your friends through social networks. In order for that de-commercialization to occur, consumers must trust the brand messages. That’s why word of mouth and public relations are so much more powerful — they appear objective and thus, trustworthy. But, a new study by Forrester Research shows consumer distrust is high in both the US and EU when it comes to social media. As you can see in the chart, consumers trust still trust recommendations from friends and family more than any other type of communication about brands. 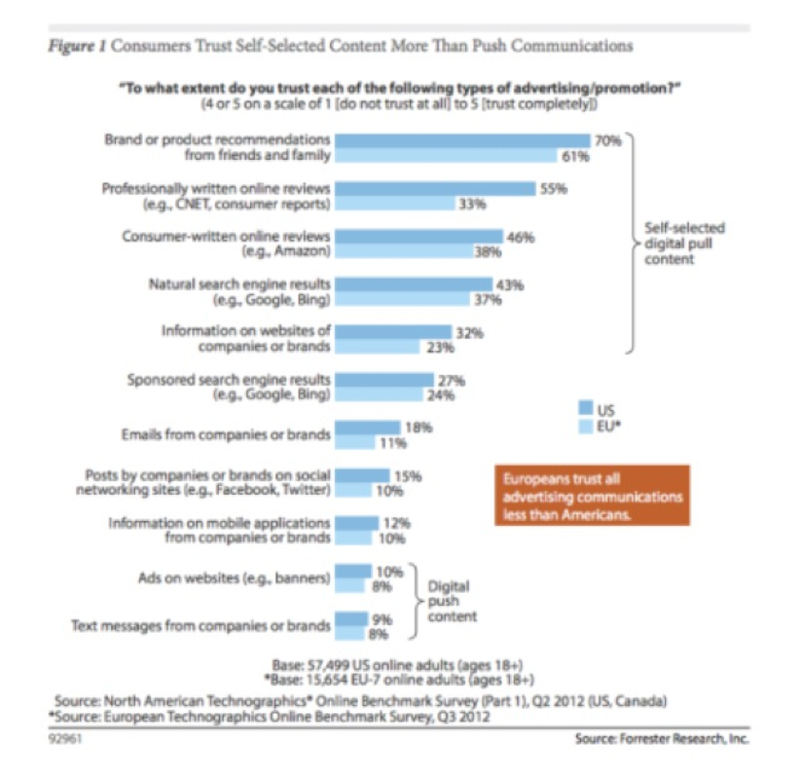 And the more control brands have over those messages, the less trust consumers have in the message. The more disruptive and less valuable the communication, the less trust consumers have in the message. So, all those text messages, banner ads on websites and mobile apps, company emails and sponsored messages from Google and, now, Facebook, don’t pass the sniff test with consumers in much of the world. Consumers learned over the years that brands lie. Brands exaggerate their performance and fudge test results to favor the brand. No wonder consumers don’t trust what brands say. Does that mean social media marketing doesn’t work? Of course not. What it means is brands need to focus on earning recommendations from consumers rather than spewing their message through the internet and social media. So, what does this mean for your social media marketing strategy? Really nothing new. If you’ve read posts on these pages, you’ll see my advice concentrates on generating earned social media marketing, rather than paid social media marketing. That’s because this social media marketing strategy works! And, nothing in this study points to any chinks in the strategy. A focus on earned social media mentions is not only more trustworthy than other forms of communication, it builds engagement that earns additional social media mentions, it boosts website visits and improves SERPS (where your website shows up in organic search), and increases visibility for your message. Authenticity – post as a “real” person and build brand personality. Provide value- value generally falls into one of these categories: information, entertainment, status, support, positive emotion. Focus on your market, not your brand – celebrate your market, support them, give them value. Don’t talk about yourself all the time. 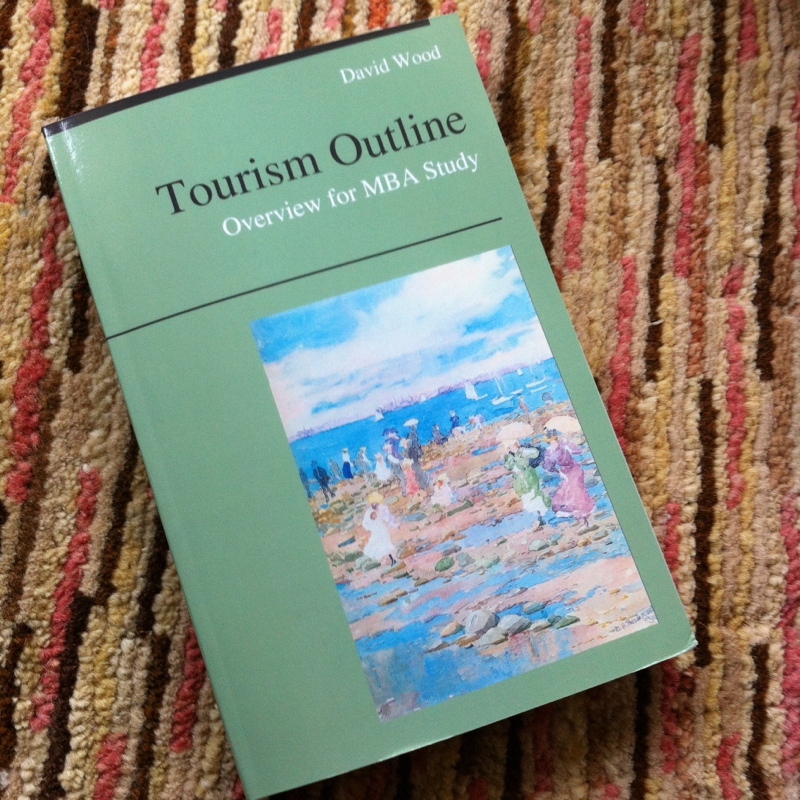 In fact, recommendations suggest 90%+ of your communications should be about your market. Ease the task of recommending your brand and passing those recommendations on to consumers’ social graphs. Listen and learn about your target audience. Monitor brand sentiment and respond to customer queries or complaints 24/7. Motivate loyal customers to share about your brand. 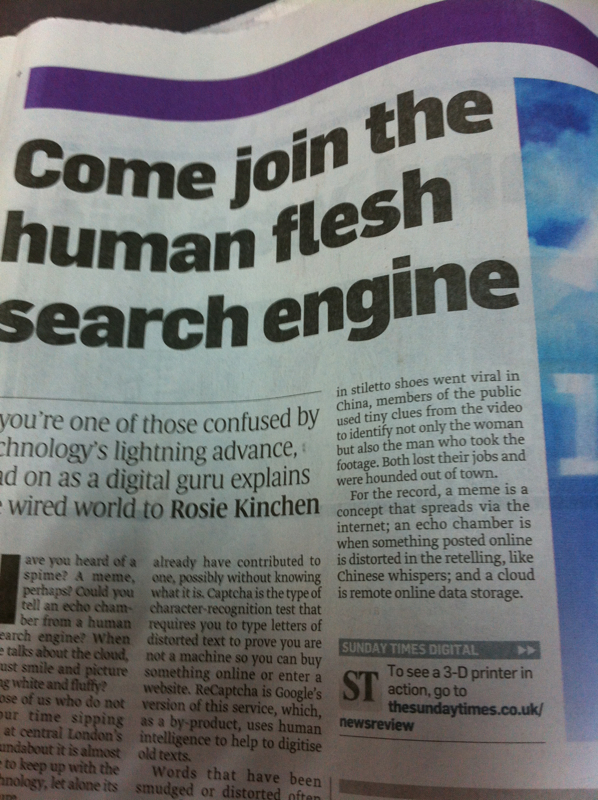 Don’t forget marketing starts well before you get online. Social media marketing requires a strong focus on building quality products, providing superior service, selling at the right price in the right place at the right time, solving consumer problems, and communicating customer value. If you’re missing any one of these elements, take a step back to focus on getting your marketing right before taking the show online. We’re here for you. Our flexible social media marketing and traditional marketing programs provide affordable solutions to mid-sized businesses and organizations using a virtual agency model. As a virtual agency, we provide the best talent for your project without the high overhead of traditional agencies. Click here to find out more. Or subscribe to our marketing newsletter to learn more about how to construct a sound social media program for yourself.